The Aura Holohan group, no strangers to winning top industry awards, have been ranked in the Great Place To Work top 30 Best Workplaces for the third year in a row and is the only health and fitness company to make the list. As one of the smaller companies in the category, the group were absolutely delighted to have finished strong, coming in at number 17, against some of the most successful multi-national companies. 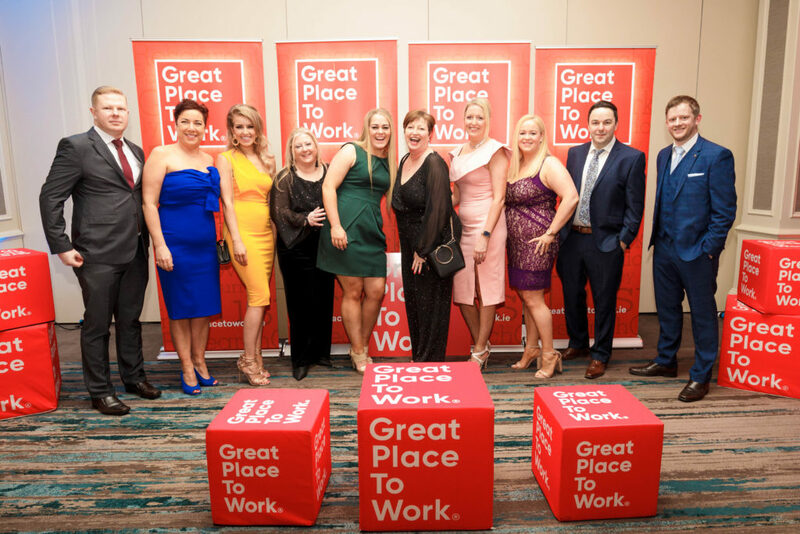 The Aura Holohan team were presented with the award at the annual Great Place to Work Best Workplaces in Ireland Awards at the Clayton Hotel on Burlington Road, Dublin on Wednesday 27th February. Great Place to Work Ireland assess all companies through a robust ‘Trust Index©’ employee survey, a thorough ‘Culture Audit’ and as assessment of their policies and practices and their approach to managing & engaging people. Speaking at the event on Wednesday, Gar Holohan, Executive Chairman of the Aura Holohan Group commented…. The Aura Holohan Group is one of the largest employers in the Irish leisure sector. The brands within the Group include, Aura Leisure (10 Leisure Centres Nationwide), Anytime Fitness (2 Clubs in Dublin), DKIT Sport (Dundalk) and the support office in Dublin where they also operate Holohan Leisure Consultancy. The group is Ireland’s foremost specialist in the management of sports & leisure facilities, focusing on quality award winning service across all operations. The Group has won prestigious awards including 02 Ability Awards, EIQA Safety / Hygiene Awards, NISO Safety Award, White flag Gold Standard Award, Best Employee Development Award, Best Fitness Facility of the Year Award and the Ireland Active ‘Outstanding Standard’ award. Aspire Talent Development Programme which gives employees unrivalled access to training, development and further career opportunities. This allows employees to upskill to have the opportunity to work in multirole positions. Access to the Aura Teaching Academy and Fitness Academy which offers opportunities to certify to the highest industry standards in a range of industry practices. GEM Awards programme and Nominate 2 Celebrate programme, acknowledging those who go the extra mile. EAP Programme – a free confidential comprehensive advice and support service ranging from financial and legal advice to counselling for you and your family members. The groups mission is ‘to improve the health and wellbeing of our communities through exercise, sport and active lifestyles’, and vision is to create ‘a healthier and happier Ireland’. The group is constantly seeking people who want to join their mission and align with their vision and values and have a number of job opportunities available for Swim Teachers, Lifeguards, Personal Trainers, Fitness Instructors, Memberships Advisors, Duty Managers as well as Operations Managers. Please visit www.jobs.ie/Holohan-Group-Aura-Leisure for more information.